These three bones are connected by cartilage, ligaments, tendons, and muscles, and create the ball and socket joint of the shoulder. The shoulder joint allows for almost complete circular motion of the arm. However, this extraordinary motion can result in a loss of stability of the shoulder joint and lead to injury. You can learn more about the anatomy of the shoulder by downloading our educational document A Patient’s Guide to Shoulder Anatomy. Rotator Cuff - This is a collections of muscles and tendons that connect the shoulder blade to the arm bone and support the motion of the arm. 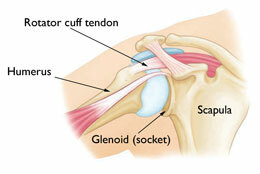 Damage to the rotator cuff involves a range of injuries including bursitis, tendonitis, and rotator cuff tendon tears. Arthritis - Can be caused from previous injuries to the shoulder or just everyday wear and tear. Arthritis pain is typically a dull ache but can become extremely painful with everyday movements. Impingement - This happens when the top of the shoulder blade, called the acromion, puts pressure on the soft tissue (bursa and tendons) underneath. When you try to lift your arm, a bone spur on the acromion can put pressure on the rotator cuff tendons and bursa making it painful to move your arm. Over time this can lead to tears of the rotator cuff. Shoulder dislocation - When the upper arm bone is forced out of the shoulder socket or dislocated from where it belongs, there can be bone, ligament, tendon and muscle damage in the area. Sometimes this injury leads to painful recurring partial or complete shoulder dislocations. This usually happens as the result of a sudden movement or impact. Fractures - This can be a break in any of the bones that make up the shoulder. Typically this is caused by a sudden impact, sports injury, or fall. Depending on the injury there may be several options for treatment before surgery would be considered. Our orthopedic surgeons will visit with you to assess which part of the shoulder hurts and the intensity of the pain. They are also likely to request diagnostic images such as an x-ray or MRI to be able to see inside your shoulder joint and look for tears, fractures or other signs of injury. If non-surgical treatments fail, arthroscopic surgery is sometimes used as a tool for investigating and fixing the cause of pain. Physical therapy, including aquatic therapy, myofascial therapy, and dry needling.